Most of my friends in Stockholm work so it makes more sense for me to be there during weekends than weekdays. So why on earth did I board a Saturday 8 a.m. flight back to Germany then? Because of the pastor! 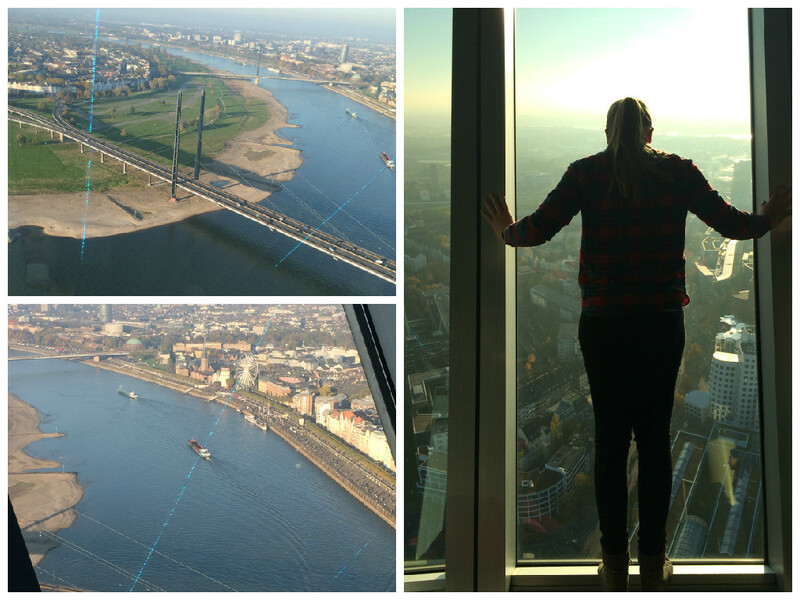 When I moved to Hamburg, things were difficult at first. The Swedish Church became my refuge and their pastor took me in when I couldn’t find an apartment, he listened to me when I was down and he inspired me with his sermons. 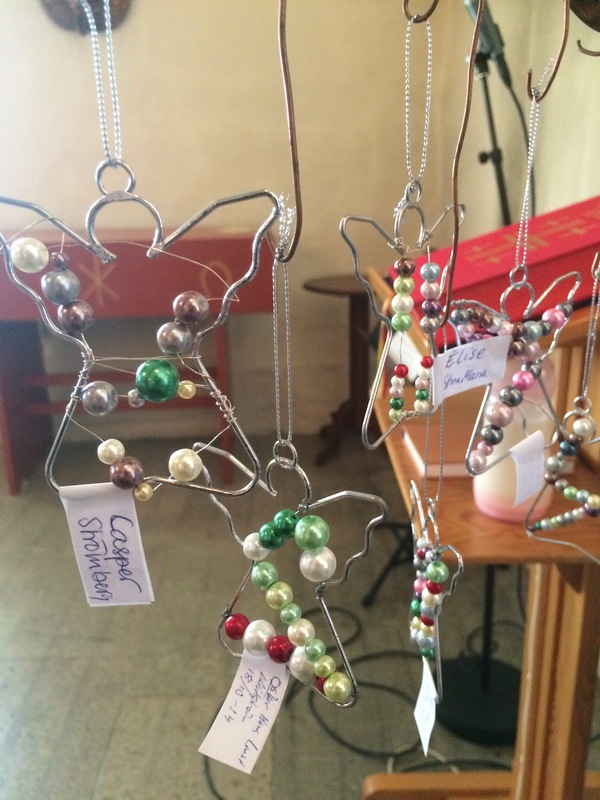 I on my part volunteered as a cafe girl and Christmas market sales woman, took out the church’s garbage cans and attended mass almost every Sunday. Long story short, this pastor has been the first one I really had a connection with, this church has been the first that felt like a home. Today was his last day and I was not going to miss that even if it meant inconvenience to the travel plans. 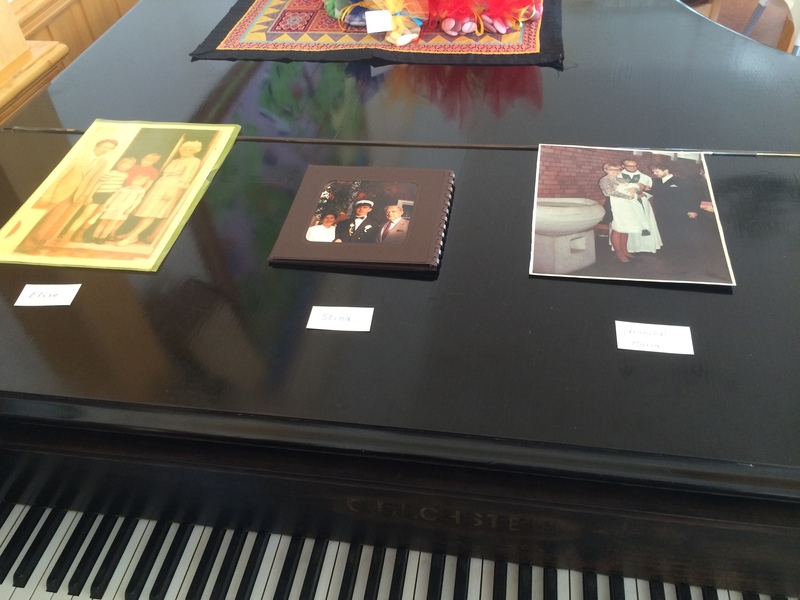 Ingrid and I did not want to left our pastor go without a proper goodbye – so we made a song. Actually, my mom and I made the song, a new version of “A student from Uppsala” (since he is from there) and Ingrid and I taped us singing it in her kitchen. We had just one take for it due to time restraints, let me assure you that’s difficult if you haven’t had time to rehearse either. But we’re both experienced choir singers so we managed! This weekend, Anna visited me. We partially grew up together and we still love being around each other. 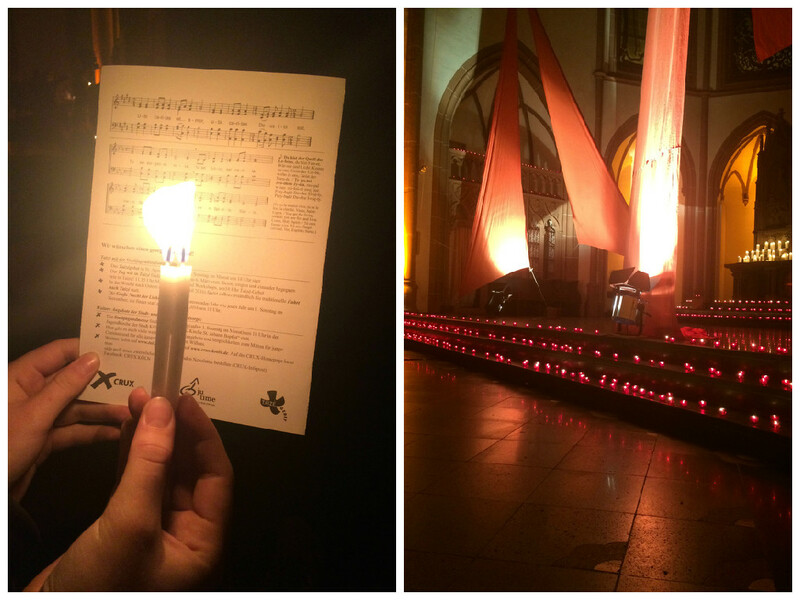 I was made her patron at her confirmation this year and my gift was that we would go to the Taizé night in Cologne together. Before that, we spent a day in sunny Dizzeldorf, trying to complete a city rally. The questions were tough, the solution word was ridiculously easy (“Welcome to Düsseldorf”, lame). 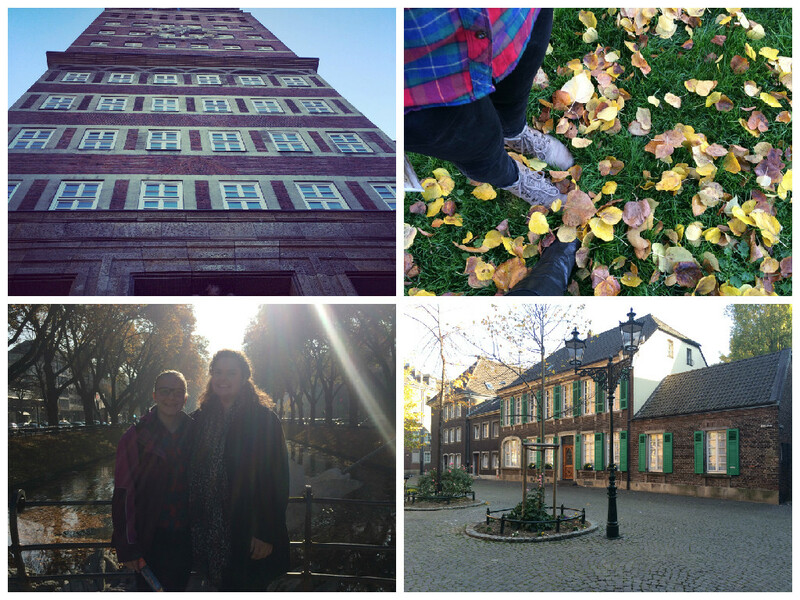 We learned that Düsseldorf had the high-rise office building in all of Germany, built 1922, and discovered a very picturesque little square in the middle of town, well hidden behind two churches. As we were standing there, trying to figure out where to go next to find out the next solution, two men stopped. “Helen? Are you Helen?”, one of them said, removing his sunglasses. My brain immediately started chattering. Was this someone from choir? Maybe from work? Have I met him at some newcomers event? Was this someone I knew from out of Düsseldorf? “Ralf”, he said and strechted out his hand. It dawned on me. Of course! This was my mother’s cousin, his mother had told me he lived here and she took my details then to inform him. I apparently have predisposition to meet formerly unknown relatives in the most unexpected places (see here). But how on earth did this friendly fellow recognize me when walking by given the fact that he has not seen me for, like, 25 years? “You resemble your aunt”. That’s not the worst. Oh, I think christenings can be quite wonderful. Today I had the pleasure of attending the picture perfect christening of Elise, my friends’ daughter: from the extremely beautiful landscape and church, the happy little baby to the lovely reception afterwards. 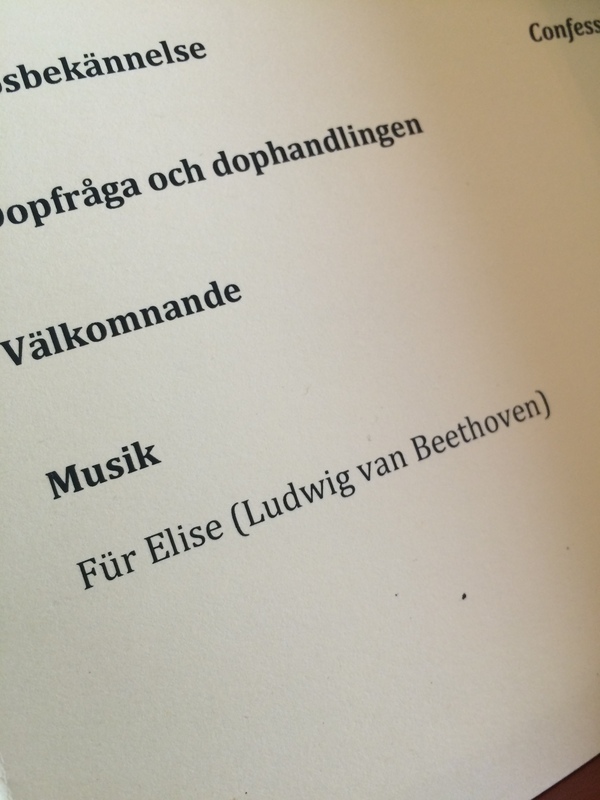 They picked all the right songs (from my oh so objective perspective), including Det gungar så fint (with one line saying, “You are never again unwanted or alone because you belong to God”), Kärleksvisan and Måne och Sol, and very fitting, Für Elise. Also, the pastor did what seems to be a new thing in the Swedish church: to hold up the newly christened baby and carry her through the church. Extremely strong resemblance to that Lion King Scene where Simba is held up by the monkey Rafiki and shown to his lion people. The pastor’s sermon was then about how our friends’ baby now had God’s watermark on her heart. 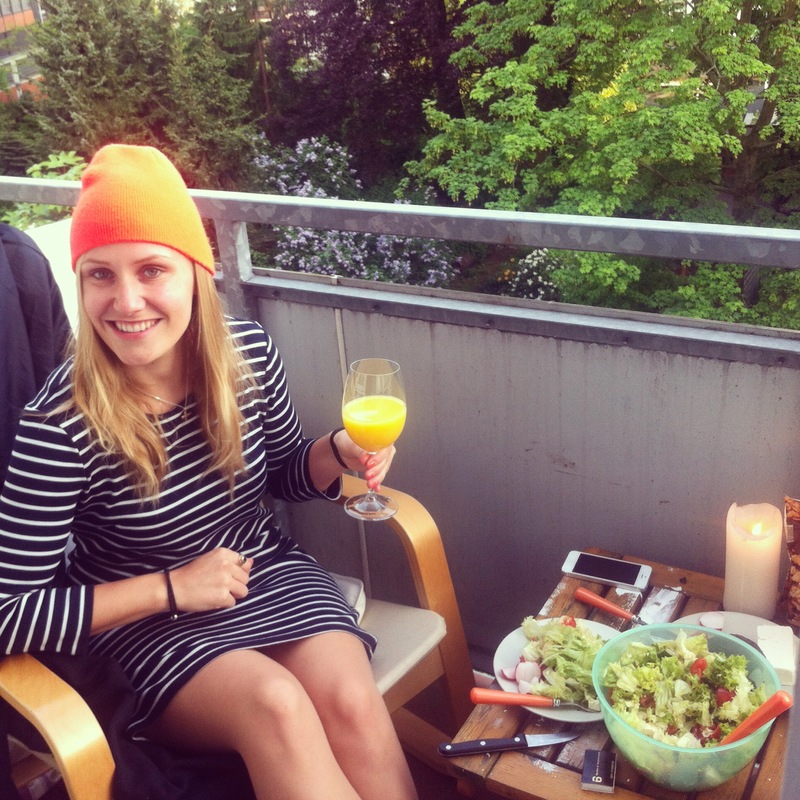 Still contemplating if I should convert fully to the Swedish Church. Anyway, it’s the middle of the night by now so I won’t make this decision tonight…. 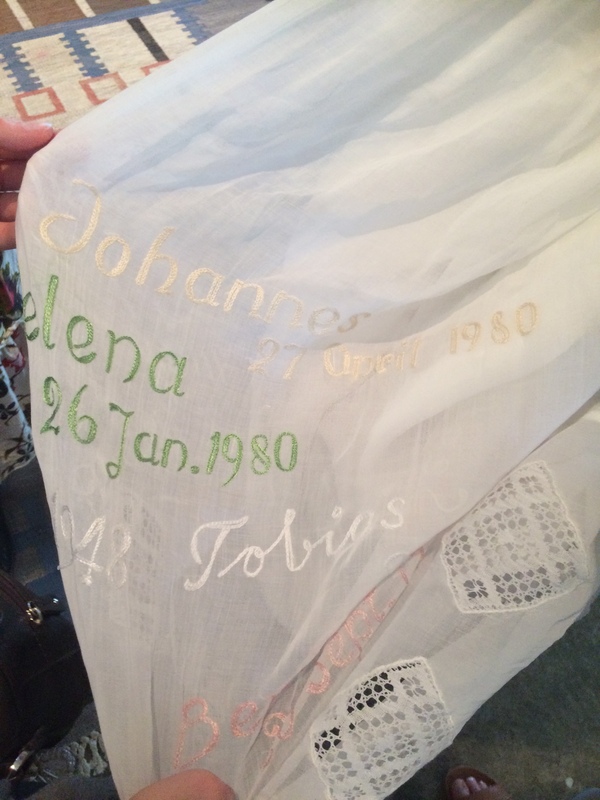 The dress which has been used in the family since 1945 with all the names of the children that have worn it to their christening on it. Most wonderful tradition! I cannot remember the last time I walked into a Catholic church on a normal Sunday to find it completely full with people. Today, I made a superficial choice of church by going to the one that has the prettiest interior. 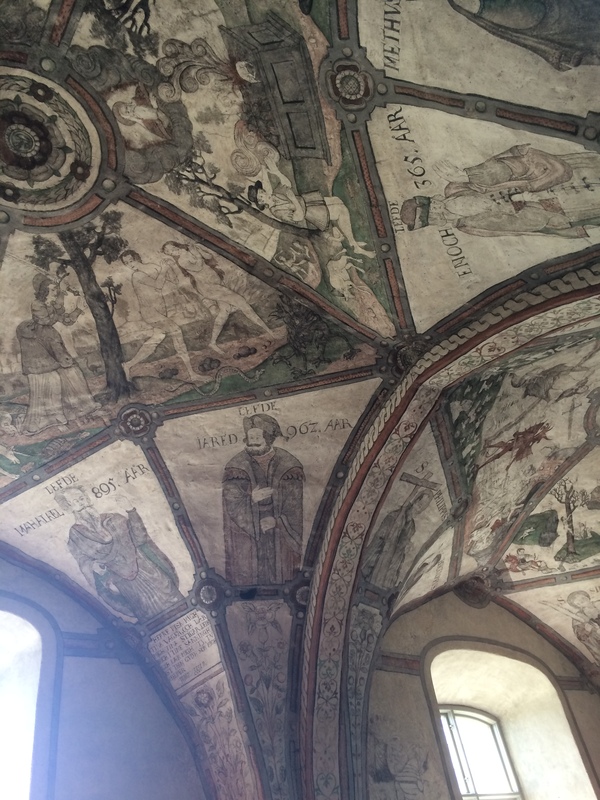 Saint Andrews is, as I have learned, one of the very few early-baroque churches in Germany, and it is decorated with countless carvings in the ceiling and on the walls. Maybe all those people also came for the decoration but they seemed definitely to be regular church-goers because the leaflet we got (after securing one of the last seats) had no notes. Apparently everyone knows all the hymns by heart. Luckily, Catholic church songs are not overly creative so you get the hang of them quickly. 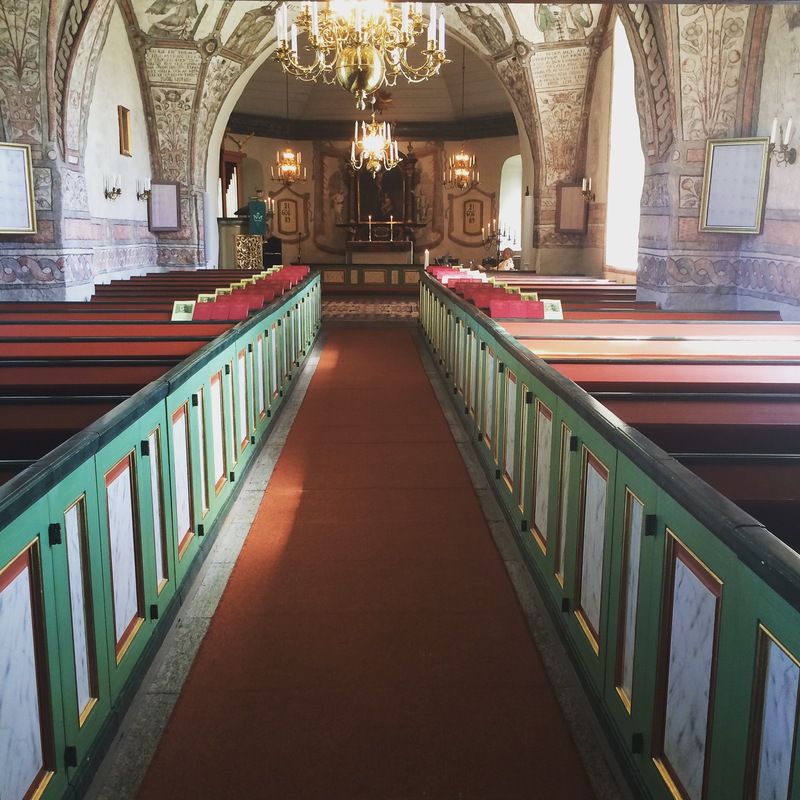 While I was not all too impressed with the service (is there even a return to the bosom of the Catholic Church after years of Svenska kyrka-fication? ), I did learn that today was the Day of Saint Apollinaris and that that’s the patron saint of Düsseldorf! Before, I had only known that name from the popular German mineral water called Apollinaris. Much to my confusement, that saint is the saint of wine and that does not make sense to me at all, neither from the water-perspective nor from the Düsseldorf-connection. (Düsseldorf is famous for its Altbier, a dark beer.) But I shall not judge these circumstances but simply listen and learn: it is Saint Apollinaris I must pray to for better cycle paths in the city. Because I find my housing situation desolate, I decided to look at the subtenant market. My case is tricky because I only need a furnished place for some months as I am planning to fully relocate next year. It is the same time that students are away when they go for their exchange winter semester. That’s great, I thought, and looked at three students’ apartments. I am seriously stunned at the size and prize of these apartments. When I was a student, we also paid a rent of 600 euros – for three people. Not for one person that lives on 60 square metres. How do they even afford it? I must suppose that Düsseldorf students are very rich. At least that’s what I thought when I was told, “You know, I don’t have rent out while I am in London, I just think it’s a nice gesture”. Of course. Meanwhile, cars preferably stop on the bike lanes to deliver goods or drop people off. I have never seen so many cars blocking the bikes lanes as in this city, it is truly amazing. And it shows the Green Party has not been in government long enough. Still, I adhere stubbornly to my bike resolution and I keep telling myself if my ex-co-worker Sarah can get through all of Hamburg by bike, I should manage with a town considerably smaller. 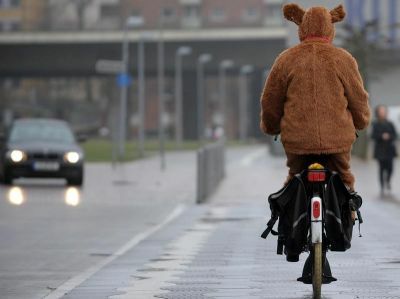 I may not be known for bravery but cycling in this city is a brave act. There is an overwhelmingly lot of churches in this town. Churches by the river, churches sandwiched between two regular houses, churches flying lots of flags. Plus several centers for the young Christians. Wikipedia lists 95 Catholic churches alone and I was too lazy to count the dozens of Protestant and free churches. Even though I realize I am now in a very Catholic region (making me totally ordinary after years of my exotic niche existence in the Protestant diaspora), I sincerely wonder if people go to all these many churches. Personally, I am still baffled with the multitude of fanes so that I cannot even decide where to go on Sunday. Tomorrow, I’ll get back to you with some more peculiarities concering the not-so-happy people, a shocking grocery revelation and a topographic adjustment. As you know, the Swedish Church of Hamburg was temporarily closed for renovation. A big scaffold hides the pretty facade and you hear the stones falling through the tunnel kind of thing they built from the fifth story to the ground. This is why we, the Swedish church community, have sought refuge with our Scandinavians neighbours. All Scandinavians churches are located in the same street which is very convenient. I’ve learned that we are on good terms with the Finnish and we like the Norwegians. We do apparently not like the Danish because of a row some years ago. This is just rumours I heard but judging from the fact that we now are sheltered by the Finnish and Norwegian, it seems somewhat true. Our first choir practice was in the Finnish church last week. I do wonder what kind of drugs their architect was on when he designed the building. 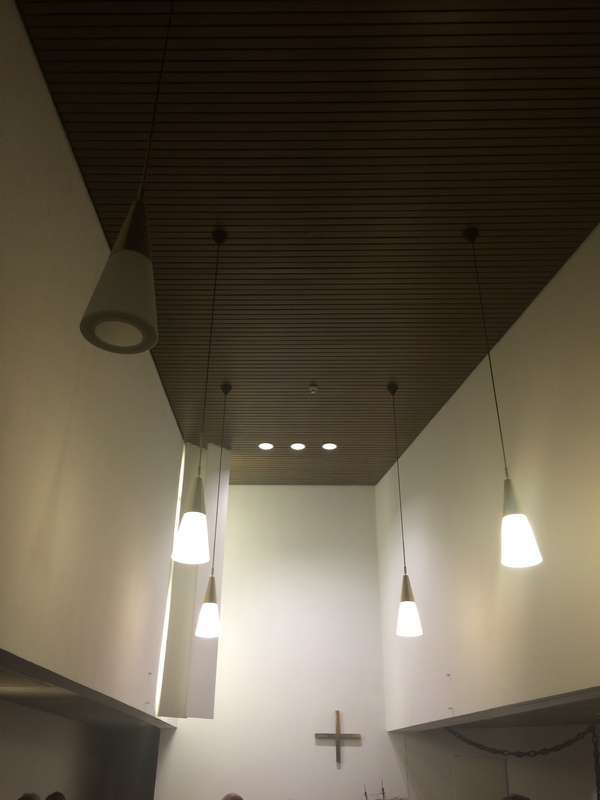 There are no windows at all, no decoration, the walls look like white prison cells and the room keeps getting smaller and the ceiling is suspended in a way that sabotages the acoustic. I also feel like I am in a foreign country because I do not understand a single word that is written in the Finnish hymn book. I looked at the page with the usual prayers, the Lord’s Prayer, the Creed and such, but I could not even discern which one was which. That is not the Finnish Church’s fault though and I am anxious to point out that I think it is very nice of them to let us be in their church, do not misunderstand me. Also, it is very charming when you are sitting there and suddenly a tango tune plays somewhere in the house. Because the Finnish, they’re tango dancers in case you didn’t know. Many Swedes pretend they don't understand Norwegian and Danish. That is not true. 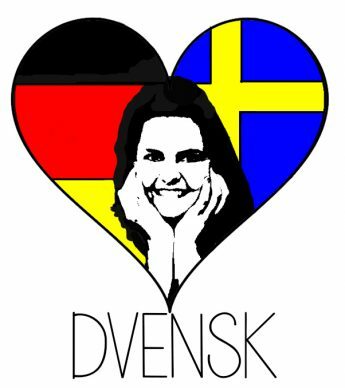 We just don't approve of pseudo-swedish blabberers. 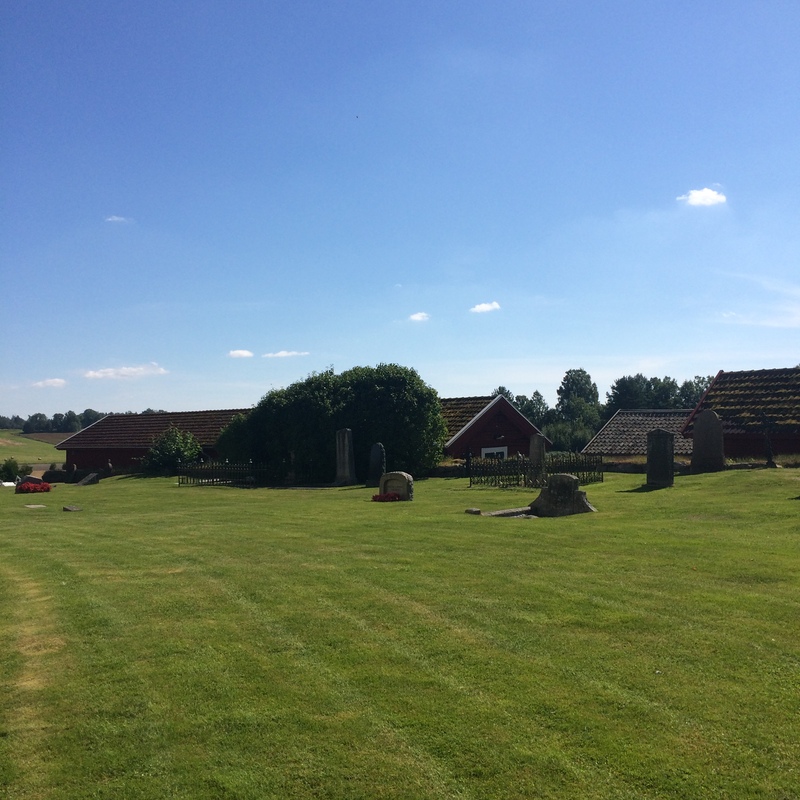 This morning I attended service in the Norwegian church. 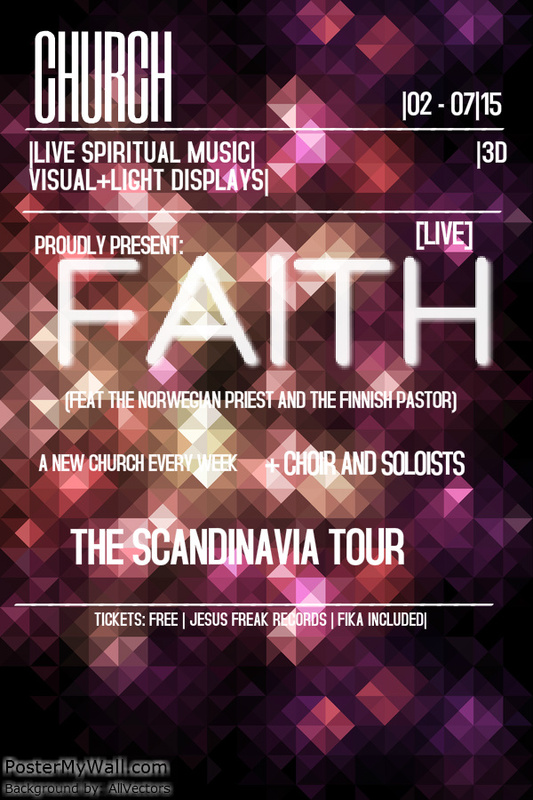 Every week a new church, I feel like I am on a tour through Scandinavia (see poster). The Swedes consider the Norwegians for historical and lingustic reasons their brother people. (Even though they keep teasing each other but when the going gets though, they stand side by side, very closely.) Today for the first time, I could really feel why. When I came in late, the door was held open for me and I came into a church that was not as wonderful as ours but still much nicer than the Finnish one and there was a likeable Norwegian priest talking. Norwegian sounds always-happy and more or less understandable to Swedish-speaking ears and compared to Finnish, you feel like you’ve finally found your way home. There were Swedish and Norwegian songs sung and our Swedish pastor held the sermon saying some very smart words on Je Suis Charlie. The only time that almost tripped me up was when we said the prayers in our respective languages. La viljen din skje på jorden slik som i himmelen is close but phonetically not the same as Låt din vilja ske på jorden så som i himlen. My absolute favorite part of the Norwegian service must have been that they had dogs in church. To bring children is normal but bringing your dog is…awesome. I must say they were very hansome, obedient dogs. 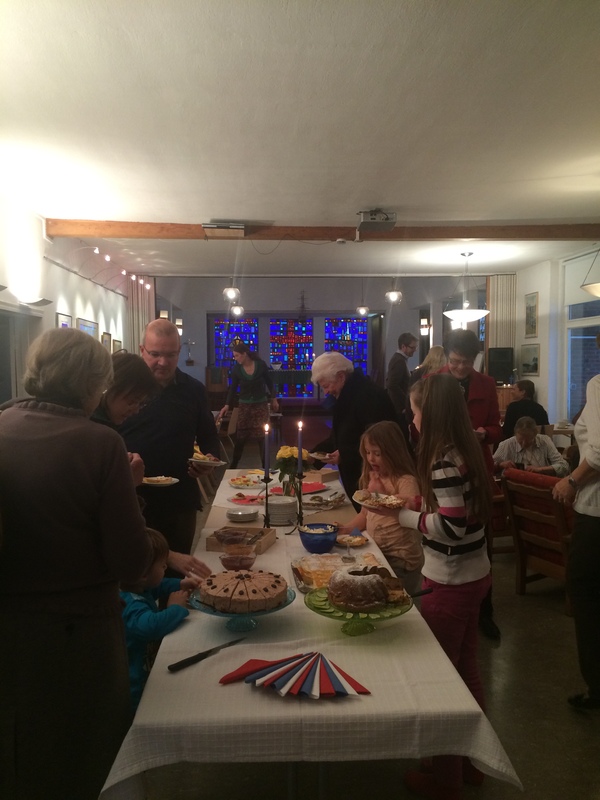 Afterwards, we had fika in the community room that was adjacent the church room. Basically, it is all one big room. 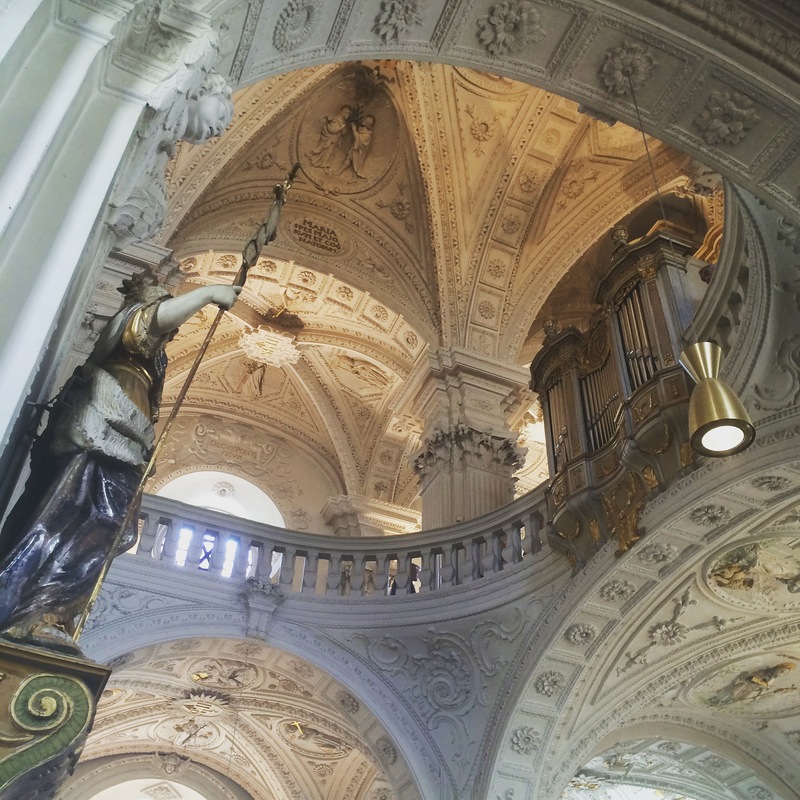 Having grown up with Catholic churches where the sacral space is demarcated clearly from the mundane, I felt like the first Christians must have felt when they had service in their living rooms. 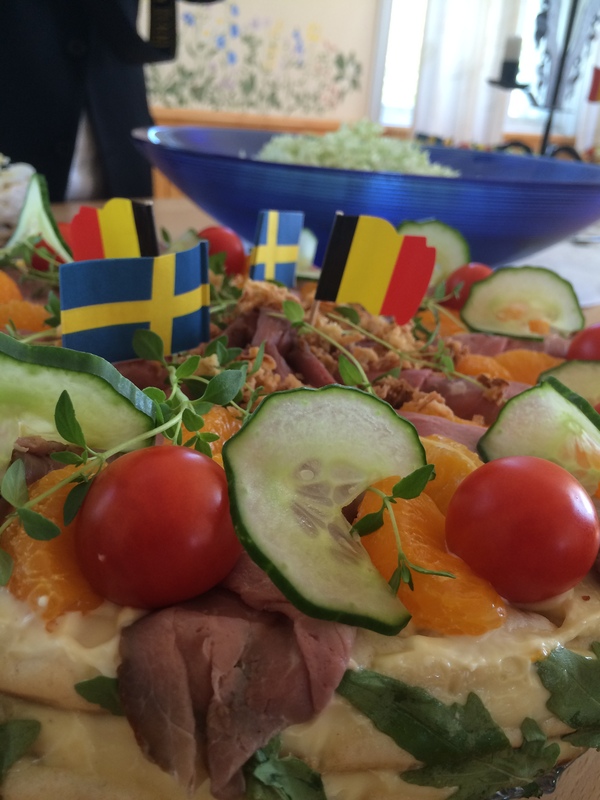 The Norwegians had served lovely fika for us and on the one side of the buffet, they had placed napkins in the Norwegian colors and on the other, napkins in the Swedish colors – the loveliest gesture! So as we are sitting there and I am concentrating very hard on getting the alto voice for Sommarpsalm right, the choir leader starts talking about advertising the concert. “We’ll need a nice poster”, she says and immediately looks to me. “I think you’re good with these things. You should do it”. 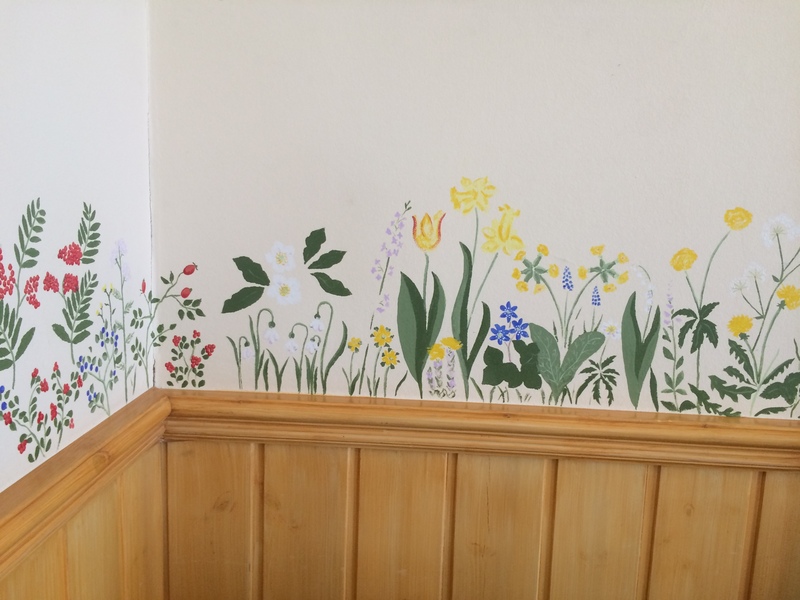 I am puzzled that she thinks I am the best person to do it and now in retrospect, I understand: the choir leader has seen the notices we made for my apartment hunt, and she did not know that this was a joint effort of the incredibly talented Ingrid and me. I accept the task only to say, “If my dear friend Ingrid over there helps me, sure”. After practice Ingrid and I sat in my living room upstairs in the church and started brainstorming. We brainstormed so much that we decided we should have a name for our creative duo (because who knows what else we will do in the future) and give ourselves fancy titles. So now we are the Heling Agency for Feel Good. Ingrid is the Art Director (obviously) and I am the Visual Supervisor and Copywriter. We only need to find someone who wants to start paying us, too. 😉 If you need a choir poster, an apartment video, a book on bowls, a new text to an ABBA song, or simply need to feel better, you can hire us.